This article is about the 1991 revival series. For the original 1960s soap opera, see Dark Shadows. For the 2012 film, see Dark Shadows (film). For other uses, see Dark Shadows (disambiguation). Dark Shadows (later referred to as Dark Shadows: The Revival) is a prime-time television series which aired on NBC from January to March 1991. A re-imagining of the 1966–71 ABC daytime gothic soap opera Dark Shadows, the revival was developed by Dan Curtis, creator of the original series. The 1991 Dark Shadows tells a streamlined version of the original storyline – the arrival of governess Victoria Winters at Collinwood, vampire Barnabas Collins being released from his coffin, Dr. Hoffman's attempt to cure Barnabas' vampirism medically, and, finally, Victoria's time travel back to 1790 to witness the events in which the still-human Barnabas is transformed into an undead creature. Having declined several previous inquiries about reviving Dark Shadows, Curtis was contacted by NBC's then-head of programming Brandon Tartikoff in the summer of 1987. The reluctant Curtis was eventually persuaded by Tartikoff, who "wouldn't let up". Of the revival Curtis said, "The essential characters and relationships are the same, but the things they do are different. I thought I could rely on those old scripts, but I found that they were full of crazy plots that we couldn't use. So all the incidents are different; we arrive at similar points through a much different route." According to Curtis, he co-wrote and directed the first five episodes himself, "to get it off in the style I wanted." However, Curtis received co-writing credit on only two completed episodes. The revival series was produced by MGM Television, whose parent company had produced the two earlier theatrical films (now owned by Warner Bros./Turner Entertainment). A majority of the series was filmed at the Greystone Park and Mansion in Beverly Hills, California, and some period wardrobe from the 1988 film Dangerous Liaisons was used. Victoria Winters arrives at Collinwood, a Gothic mansion on a cliff overlooking the ocean near the small seaport Maine town of Collingsport, as the recently hired governess to the 10-year-old troubled David Collins. David's gruff father, Roger, distrusts Victoria from the start while his mysterious widowed sister Elizabeth is more hospitable. When the simpleton and trouble making groundskeeper Willie Loomis, the nephew of Collingwood housekeeper Mrs. Johnson, is convinced of an old Collins family legend of buried treasure, he breaks into the Collins family crypt and accidentally releases vampire Barnabas Collins from his tomb. Barnabas introduces himself as a distant relative from England and begins to romance Victoria. At the same time, the town of Collinsport is being upset by a series of deadly attacks. After being bitten a second time by Barnabas, Daphne Collins dies and rises a vampire. She attacks first David, and then her boyfriend Joe Haskell who gets bitten and falls under her spell. Professor Michael Woodard enlists Sheriff Patterson and the police to help him stop Daphne before the claims another victim. Meanwhile, Dr. Julia Hoffman discovers Barnabas's secret that he is a vampire when she discovers that he casts no reflection in a mirror, and offers to cure him of his immortality curse. Also, Roger is revealed to be having an affair with local artist and tarrot reader Maggie Evans. Dr. Julia Hoffman begins her experiments to cure Barnabas of his vampirism. Meanwhile, Professor Woodard attempts to uncover the identity of the vampire and begins to suspect Barnabas, but Julia will do anything to keep him from finding out. Victoria begins to fall for Barnabas who becomes haunted by his guilt and of his lost love Josette. Also, David begins having nightmares about Daphne, Caroline and Victoria turning into vampires and attacking him. Later, the ghost of Sarah Collins tells David that a newer evil exists. Julia and Sheriff Patterson respond to a call by Professor Woodward only to discover that he is now a vampire turned by Barnabas and they are forced to kill him. Plus, the photo evidence Woodward claimed to have is gone. As Julia continues her treatments with Barnabas, he begins to cast reflections in mirrors and walks for limited time in the daylight while he continues his charismatic charm over Victoria. However, the ghost of Sarah Collins appears before Victoria and leads her to her diary. Meanwhile, an evil apparition of Angelique (a nemesis from the past) begins to manifest at Collinwood. After learning of Barnabas' affection for Victoria, a jealous Dr. Hoffman decides to sabotage the progress of the cure for Barnabas which results in his blood-cravings returning as well as aging to his true 200 year-old-age. Meanwhile, Caroline resumes her romantic pursuit of Joe despite his reluctance to move forward. Also, Maggie has another vision of something terrible happening to Caroline. Having reverted back to his evil self, Barnabas bites Carolyn and puts her under his spell and persuades her to kill Julia for the failed experiments. Elizabeth throws a costume party at Collingwood where Barbabas now avoids Victoria and is bent on seeking revenge against Julia who soon realizes that Carolyn is now targeting her. When confronted, Barnabas tries to kill Julia until an intervention from the ghost of Sarah prevents him from doing so. At Maggie's suggestion, a séance is held to contact the spirit of Sarah for answers, but during the event Victoria disappears and another woman appears in her place. Transported to the year 1790, Victoria meets the residents of Collinwood each of whom strongly resemble the present day characters of Collinwood. Victoria becomes the tutor for Daniel and Sarah Collins. Victoria also meets and makes an ally of Peter Bradford, the Collins foreman, as well as the young Barnabas who is eagerly awaiting the arrival of his fiancée Josette. But Josette's handmaid, Angelique, is determined to keep Barnabas for herself, who refuses her advances. Angelique is revealed to be a powerful witch who puts the simpleton carriage man Ben Stokes into making him her slave. Abigail Collins begins to suspect Victoria of witchcraft. In 1790, a jealous Angelique uses witchcraft to prevent the marriage of Barnabas and Josette Du Pres by casting a spell to make Josette fall in love with Jeremiah. Meanwhile, Victoria and Josette are both stunned by the similar appearances with each other when they meet for the first time. When Barnabas finds out about Josette and Jeremiah running off to elope, he purses them where a deadly duel ensues. Due to the strange happenings, Abigail only grows more suspicious of Victoria. In the present day, Elizabeth, Julia and the rest of the family deal with the presence of the ailing Phyllis while trying to find a way to bring Victoria back to the present. During Jeremiah's funeral, Josette accuses Barnabas of killing her true love. Abigail enlists the aid of Reverend Trask to have Victoria Winters jailed for witchcraft. Barnabas hires Peter as Victoria's lawyer to defend her. Meanwhile, Angelique uses black magic to resurrect Jeremiah as a zombie under her control to kill Josette. When Barnabas finally discovers that Angelique is the witch responsible for everything going on, he kills her, but not before she places a curse of eternity upon him in which he later gets bitten by a vampire bat. In the present, the Collins family continues looking after the ailing Phyllis, while Carolyn continues to be under Barnabas' control. Maggie holds another séance to try to find Victoria only to have Angelique's spirit arrive and possess Julia. In 1790, the Collins Family mourns the apparent death of Barnabas as they move into the new Collinwood mansion. Meanwhile, Peter enlists Natalie's help to help Victoria prove her innocence. That same night, Barnabas rises as vampire and first makes Millicent his first victim. The vampire attacks in Collinsport only increase the fanatical Trask's belief that the incarcerated Victoria is responsible. Victoria tries to persuade Josette to leave Collinsport before something happens to her. In the present day, Joe discovers that Carolyn is under Barnabas' control. When Sheriff Patterson refuses to do anything, Joe plots to take matters into his own hands. Victoria's witchcraft trial begins where Rev. Trask, acting as the prosecutor, tries to play on the fears of the community to act in his favor as well as testimony from Abigail. Despite Peter's best efforts at a defense, including testimony from Ben that Angelique was the real witch, Angelique's spirit appears in open court and points out Victoria, the stranger in the community, of being the witch. In the meantime, Josette continues to fall under Barnabas' control as he seeks to make her his vampire bride. But Angelique's evil spirit seeks to prevent Josette from becoming a vampire by giving her visions of her life as a "creature of the night". In the present day, Joe tries to stake Barnabas in his coffin, but is prevented by the possessed Julie who kills him before she is subdued by Willie. In 1790, Barnabas' vampirism is finally discovered when he lures his mother, Naomi, to the old house to reveal himself. Unfortunately, Abigail also arrives at the old house where Barnabas kills her. Daniel and Sarah witness the events and while attempting to flee, get lost in the woods during a storm where Sarah falls ill and soon dies. Meanwhile, Peter attempts to save Victoria from being hanged as a witch by filing every appeal possible. Victoria comes to realize that Barnabas is indeed a vampire and that Angelique is the witch responsible for her arriving in the year 1790 in order to kill every member of the Collins family. When Barnabas learns about Victoria's plight, he gets revenge against Reverend Trask by walling him up alive in a wall of the old house. Things come full circle as Joshua learns that Barnabas is a vampire in which he has Ben seal him alive in his coffin, and has Naomi, driven insane from the truth, imprisoned in the tower at Collinwood, while Daniel recovers. In the present, Maggie attempts to perform an exorcism on Julia to expel the spirit of Angelique, who instead possesses Maggie who tries to kill the comatose Phyllis. In 1790, Peter tries to help Victoria escape, but he gets shot and severely wounded. Just as Victoria is about to be hanged, she is transported on the scaffold back to the present, and Phyllis is transported back to 1790 and hung in Victoria's place. Victoria arrives safely back in the present day, but she now knows all about Barnabas and his secret of being a vampire... and he is also aware that Victoria knows about him. 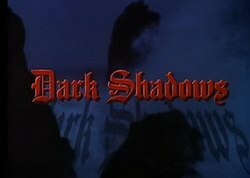 Dark Shadows premiered as a four-hour miniseries event on January 13 and 14, 1991, and then moved to a regular Friday night schedule. Though the series debuted to great success, watched by nearly 1 in 4 households, ratings declined as the show struggled to find an audience. Some fans blame the declining ratings on the onset of the Gulf War, and the focus of NBC's promotions on horror and vampire themes rather than romantic fantasy themes. With the 12th and last episode of the season ranked 64th among 83 shows, Dark Shadows was cancelled. NBC received over 7,000 letters of protest from disappointed fans, who also picketed network headquarters in both Los Angeles and New York City. The original VHS release from MPI Home Video features an extended pilot episode and extended final episode, and also presents the original one-hour versions of episodes 2 and 3 (for broadcast, NBC combined them into a movie-length version so they could air that and the pilot as a 2-night mini-series to kick off the series premiere), so the home video presentation of episode 3 restores the "I'm Victoria Winters" opening narration that was left out of the movie-length version (the one-hour versions of these two episodes are also the ones that were shown when the series was repeated on the Sci-Fi Channel). The 2005 DVD release from MGM Home Video, although re-mastered in High Definition, contained alterations to the original image presentation. Firstly, the overall image was cropped from the original full-screen image to a 1.78:1 widescreen ratio. Secondly, after remastering, certain scenes that were shot "day for night" (shot in daylight, but meant to be altered in post-production to look like night-time) were incorrectly left untreated, presenting the problem of a vampire walking around in broad daylight. Also, this release presented the episodes the way they were shown on NBC, meaning episodes 2 and 3 were the "movie length" version and the unaired footage from the MPI release was not included at all (not within the context of the episode or even as a bonus feature). The DVD version has been re-released since that time in different packaging. Dark Shadows has been shown in reruns on the Sci-Fi Channel and Chiller. Since 2009 the series has been available for viewing online on Hulu. ^ Nutt, Shannon (October 18, 2005). "Dark Shadows: The Revival – The Complete Series". DVD Talk. Retrieved May 23, 2013. ^ Dougherty, Margot (January 18, 1991). "The Vampire Strikes Back". Entertainment Weekly. Time Inc. Retrieved May 23, 2013. ^ a b c Carter, Bill (January 9, 1991). "NBC Puts New Blood In Old Vampire Series". The New York Times. The New York Times Company. Retrieved May 22, 2013. ^ a b c d Nemy, Enid (January 13, 1991). "TELEVISION: Dark Shadows Returns to Haunt Prime Time". The New York Times. The New York Times Company. Retrieved May 22, 2013. ^ The two-hour first episode aired on January 13, 1991 and Episodes 2 and 3 were presented as a two-hour block the next evening. ^ Pierson, Jim (1993). Dark Shadows Resurrected. Pomegranate Press. pp. 20–21. ISBN 978-0-938-81724-6. ^ a b Braxton, Greg (March 28, 1991). "Pickets in Burbank Ask NBC to Revive Dark Shadows". Los Angeles Times. Times Mirror Company. Retrieved May 23, 2013. ^ Pocharski, Susan (April 26, 1991). "Mail-Order TV". Entertainment Weekly. Time Inc. Retrieved May 23, 2013. ^ Djeljosevic, Danny (12 October 2009). "Watch Full Episodes Dark Shadows (1991) Season 1 Online". WebTVWire.com. Retrieved 23 May 2013.